I think all the little ladies dream about a prince, white dress and a perfect wedding from the early age. The same we can say about our friend, Agata who decide to share with us her memories. W hen I received an engagement ring I started an avalanche of preparation and I knew that everything must worked out, even the smallest detail. By participating at my friends’ weddings, I noticed that the most important thing is good company, good music and good food. And because I love the beautiful scenery, decorations were a next priority. We were searching for the ideal place quite a long time. Finally, we chose Westin Warsaw Hotel in the center of Warsaw. While the parents initially objected and we – ourselves – were not sure if this place appeals to our guests, it turned out. Our choice was perfect. The place was an extremely elegant and at the same time without unnecessary luxury. Qualified staff to control if everything went according to the plan and the guests lacked nothing. I can not forget to mention about the Chef! He composed for us a very rich menu that appeals to even the most demanding guests. The same with desserts and the presentation aroused admiration. The whole was compiled with beautiful decorations as flowers, crystal candlesticks, candles and orchids submerged in glass tubes. Gosia, thank you one more time! A huge plus of this place is employees who leave the initiative and their own ideas. 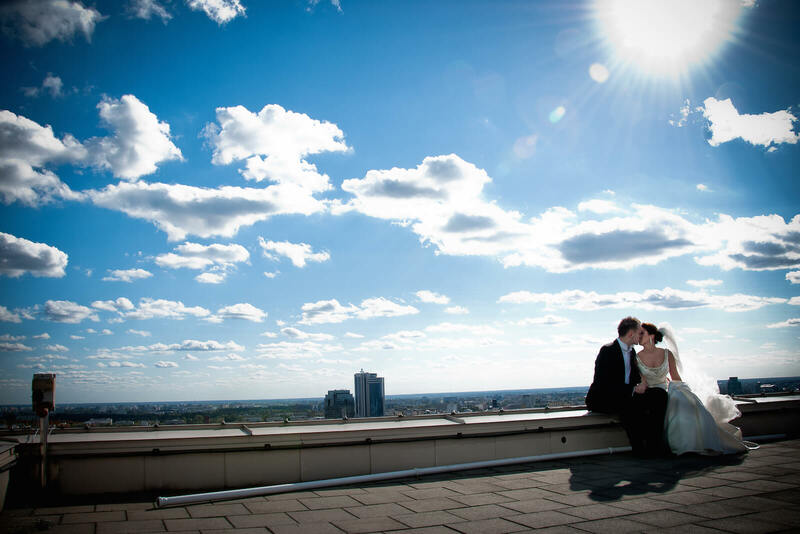 In our case, it was a proposal to do a photo shoot on the roof of this 20-story hotel. A nice surprise was also an invitation for a romantic dinner, which we received about a year later as a gift for the first anniversary. Today we still remember with emotion the day and I’m lucky because it was the wedding of my dreams, exactly what I dreamed about as a young girl. Our loved ones, family and friends with us to share this special day and the only thing I regret today is that I can not move back time. Special Thanks to Agata for sharing with us her memories!